Fil-Australian actress Jasmine Curtis Smith believes, "Roots are very important to show who you are as a person." Jasmine Curtis Smith is still on a high after her 2013 Cinemalaya award for Best Performance by an Actress in a Supporting Role in Transit. She recalls the making of the movie, "it was a pressure to fit it all in ten days. "It was crunch time for us but at the same time it was just a whole different experience to how you would should shoot anything here in the Philippines," the 19-year old awardee says. Transit follows the story of OFWs in Israel, narrated through multiple points of view, one being that of Jasmine's character Yael, whose Filipino mom (Irma Adlawan) gave birth to her in Israel. Transit is currently being screened in Glorietta 4 and Trinoma. Jasmine adds, "siyempre you get to experience a whole different culture. "And the way of life over there and to see the beauty of a different country, see where our kababayans live. More than anything it was really the most amazing experience." Jasmine is happy that the movie is also able to open a dialogue with third culture kids. She considers herself "kind of there" as a third culture kid herself. She recalls her high school days in Australia, "I think, I was a third culture kid for only six years. "Doon ko nakita yung mga Filipino kids like me who really grew up in Australia, they hardly knew the Filipino culture. "They knew it through watching Filipino channels online or, you know, through TV." Like Yael, her character in Transit, Jasmine understands how third culture kids think, "parang hindi talaga nila alam yung culture natin dito." "What's really happening, but at the same time, they enjoy their life there." IDENTITY AND ROOTS. How does a movie like Transit create impact among third culture kids? "Parang, it's hard to, it's uncertain for them to see it from our perspective." "Roots are very important to show who you are as a person." In one scene in Transit, Yael and her fellow Israeli-born Pinoy kids talk in Hebrew and dream of a country where they look like everyone else. But they also realize that they won't be accepted as fully Pinoy. "Na hindi ako Filipino, ganito lang ako, Australian or Israeli lang ako, it closes you off to so many doors on how you think about certain aspects of your life na parang kahit when you work na, you're gonna think, I am just a Psychology student, hindi ko na kailangan iba't iba pang subject." She connects this attitude to daily practical living, "siempre it goes hand in hand with how you converse with people, it's important to be open-minded about certain things, especially about your culture or identity." What does Jasmine consider the pivotal scene for her character Yael, when Yael finally stops being closed off and starts becoming more open-minded? Relating it to her own life, Jasmine shares, "I think the part when I turned around to hug Irma as Yael." She becomes a bit reflective, "that showed me, like with my mom, personally, we fight and we banter about certain petty things." "But at the same time, bibigay ka, eh, kasi you know you're wrong trying to fight your parents kasi they really just want the best for you." "They really just worry about your well-being...doon bumigat yung loob ko," the young actress says. Jasmine reveals a Transit trivia, "I mean that scene, that wasn't even...that hug was not part of the shot. It was just supposed to be our fight." She explains how the moving scene between her and Irma came to be included in the movie's final cut, "when we have a heavy scene, they let you breathe and hug it out after. It was really, just us, hugging each other." She shares how people on set, "they were very quiet, I heard them, keep going on, they had the cameras on." Because of the organic flow, she said, "you really felt it and we really felt it, and hindi nila inalis." That scene is so important to Yael as a character and Jasmine as a person because "I was touched kasi I felt that way with my mom before na parang... just listen to your mom. She knows what she is talking about." "I guess that helped a lot with my character and the crisis, the identity crisis." CONFIDENT ACTRESS. How does Jasmine see herself now? "I think, this helps a lot for my confidence as an actress. Because, I tend to doubt myself in being able to deliver properly." "Siyempre when you have an acting coach, you get sanay na may acting coach sa set doing a teleserye." "But then you do an indie film, you rely on yourself or the director, the writers, co-actors!" "It's a whole different kind of pressure. You have to think it through yourself, embody it." Compared to her mainstream experience, Jasmine adds, "yun, sabi ng coach ko, yan gagawin ko. Now this shows me na kaya ko pala. Na makinig ka lang, pero think it through, let yourself be the character and feel how you feel it should be delivered." "You're not always gonna have an acting coach and when you win an award and you know you have an acting coach, siyempre, parang sa inyong dalawa dapat yung award, hindi lang sa iyo mismo." "So parang, now, I'm confident and so thankful and happy." Add to that the fact that winning an award for a role where she is speaking in a foreign language for most of the movie must not have been easy. Jasmine remembers, "both mahirap kasi sabay siya eh," referring to acting and speaking in Hebrew. She couldn't let the language issue stop her from doing her work. "Kasi hindi mo rin magagawa yun pag arte mo. It will stop you from delivering. It was a challenge I was able to overcome. It was fun." Early on, Jasmine was able to hear validation of her work on Transit, a fact she just couldn't believe but had to graciously accept. She relates an anecdote, "I think after the first day that it was shown, even before it was shown, I think it was Direk Hannah's friend and the people who watched it. And they said I was a revelation and then from then on, people said yung nga, you're a revelation for people to see you in this light..."
Hannah Espia is a new director whose talent was discovered by Paul Soriano as a producer of the film. Jasmine flashes a wide smile, "nakakatuwa, kasi I was scared to watch it!" "Kaya when we had a block screening with my fans, I ran out of the cinema kasi ayoko pa mapanood sarili ko." She preferred watching during the "Gala night na lang when my parents are there, when the cast is complete." Jasmine didn't expect to win an award. "In Transit itself, you know, sabi ko, kasama ko si Mercedes Cabral, so I expected her to win it because she is, di ba...?" 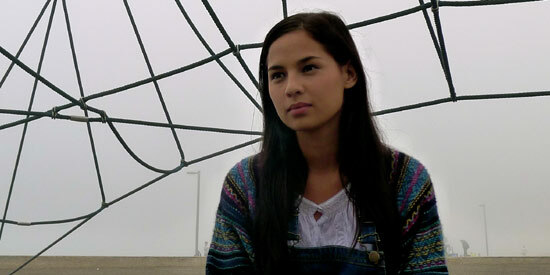 Mercedes Cabral is a regular on the indie film circuit, and was cast as a supporting actress in Transit, a fact that the newbie Jasmine could not ignore. "Within our own film, siyempre, not that I was scared, but I knew she deserved it," Jasmine relates. Every year, nominees aren't announced, so Jasmine is all the more grateful, "they didn't release nominees, no one knew. That's why when it was...I guess more, I just want to say thank you to the judges for that." Jasmine wouldn't exchange the hard work of having done an indie film for anything, because she got to work with the best, she says. "I adapted their reaction like you really have to react, whether or not you have lines. You need to learn how to react." "I was learning as I go along, listening to what happens in the scene and then reacting as the lines are being thrown." Working on Transit allowed Jasmine to completely become her character Yael, a learning she appreciates because of the depth this role gave her as an actress. "Being really, and thinking as the character, people always say that, pero dito ko inisip na ako talaga, na ako si Yael..."
"And it was the first time I did that as I played the character." SAM CONCEPCION. During the awards night, one of the first to congratulate Jasmine through Twitter was Sam Concepcion. Jasmine smiles shyly, "Oo isa siya. He was one of the people that tweeted when I won my award." Did they arrive together? Over the summer and recent events, the pair have been spotted arriving and leaving together. "Nandoon lang siya sa audience, hindi kami magkasama!" the actress firmly comments, with a smile. "I arrived earlier than him." So was Sam there for her? The young lady coyly evades, "He was there, I don't know why!" Jasmine is keeping her feet on the ground, not letting this award get to her head too much. "I don't wanna be the type of person na boasting, uy, nanalo ako ng award so give me more, seeing if they will budge or testing the waters." Whether her talent fee goes up or not after Transit does not worry Jasmine. "I am just happy to be part of a happy network." HUMBLE AND HAPPY. Does she look at it as an edge over the other TV5 princesses? "Not really, but definitely I feel as I have achieved something as a person. As an actress, individually and not comparing myself to other actresses." "I'm just really happy kasi first film, I just didn't expect any of this." "If people see it that way, then it will benefit me, I don't wanna compare lang." She has already said elsewhere that she will not stop doing open auditions even with this win. She clarifies, "it's just in our entertainment industry, hindi na siya uso na mag-audition." "Dito tawagan ka, mag-antay ka." Jasmine says why open auditions aren't hard for her, "starting out as a commercial model na I attended VTRs, it kinda felt like that, I was used to it, hindi ako, 'bakit pa ako pipila,' I didn't feel that way at all." She says the open auditions helped her, "I felt like a real and passionate actress that wanted to be in a project na you really go there and you show them na I wanna be part of this." "Hindi ako maghihintay na magpakita sa akin ng script." "I am gonna tell them I'm interested, that I can be part of their film." "I like the fact that kind of thinking is more seen in the Western part of the world and I think when you do stuff like that and you win an award, you can say, 'I didn't wait for it, I did something about it and I worked for it.' It's a bit more fulfilling when you do things that way." "Winning the award, I'm over the moon and being with such great people, you saw how dedicated they were, I am just happy."